EasySlots.com brings you Extra Cash!! Win some extra cash in this gritty working-class 5 reel. Join the mischievous street child on his journey from rags to riches as he sells newspapers to work his way up to free spin glory. The game is designed by NextGen, a company who really do know how to play slots games! They are famed for their creative ability to make complex games look simple by designing each aspect for you to enjoy. Established in 1999, these guys have a whole lotta history of making people happy by delivering stunning slots games like Bingo Billions. They started as anonymous “Aussies” and now they have their own headquarters in London. That’s what winning in life is like. 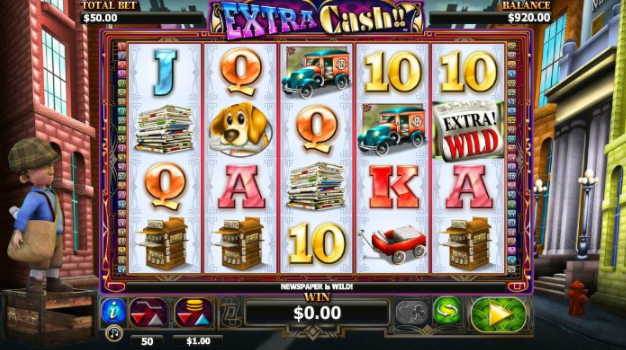 Now it’s your turn to win, with Extra Cash, the new slot machine game from NextGen. Spin the wheel today! Great success does not come without sacrifice! That’s what our newspaper boy is trying to achieve! Can you help him climb on the ladder of life while making a fortune for yourself? Get ready to engage in a time-travelling trip back to the 80’s with this amazingly designed slot machine game from NextGen and get yourself lucky alongside the main character of this title, a newspaper boy, trying his best to sell as many newspapers as possible to get himself a bit richer by roaming the neighborhoods of the times. Amazingly designed using both 3D and 2D graphics elements, this 5 reels, 3 rows and 50 pay-lines slot game frame is laid on a traditional old-fashioned, 1980’s neighborhood background with the main character constantly reacting on the bottom left corner of the frame, based on your spinning results. The reels are cheerfully designed, and here you can find the main character’s trusty dog, as well as other symbols like a newspaper trolley, a newspaper delivery van, extra newspapers, a newspaper, stand as well as a variety of letters and numbers. Helping is rewarding, right? Apart from the feeling given by the virtue of giving, you also get a lot of bonuses yourself, such as scatter bonuses, wilds, extra-wilds, and re-spins, all included as specific features of this game. Find yourself at least three of the following: A, K, Q, J, 10 symbols and you’ll get yourself up to 150x times your stake. Deliver some stacks of extra papers and you’ll be liable for up to 200x times your stake. Also, watch out for the wild symbols, that will get you up to 1000x your stake, as they substitute for all symbols, but the scatter. Generosity is the sum-up word for our newspaper boy. He can reward you big-time if you are there for him. Find him 5 delivery trolleys and get 200x your stake, or go bigger to reaching 250x your stake by landing on 5 newspaper stands. A dog is a man’s best friend, right? See it for yourself, as if you manage to land on five Beagle symbols, you’ll get yourself 300x times your stake. How fast can you go? Well, as our newspaper boy can’t drive, but you help him by landing on 5 newspaper vans and get yourself thanked by receiving 400x times your stake. Finally, the scatters are also here to fantastically reward you to up 50x times your stake. Not only that but if you are lucky enough to land on 2 or more scatter symbols you can get you re-spins or up to 20 free games. We also often run various UK slot promotions with this game. The entertaining feeling is guaranteed on this one, as the stunningly designed 1980’s neighborhood-themed slot game from NextGen delivers a great and rewarding gameplay in an action-bursting atmosphere. It trains your helping virtue while paying you amazingly high-value prizes! Help the newspaper boy deliver as many newspapers as possible and he’ll pay you big time! Another Easy game for you to try.